At some point, writer Mark St. Germain may become tired of creating plays with the central focus on an historic figure. As an audience member of seven of these works, I doubt if I will ever become weary. The powers that be at Barrington Stage Company (BSC) have recognized St. Germain’s excellent talents that its second theatre is titled the St. Germain Stage. It is not surprising that BSC kicks off its 2018 summer season with, not only a play by St. Germain, but a World Premiere. “Typhoid Mary” depicts slices of life of Mary Mallon. While most people assumed at the time (and still assume) that the derogatory name cliché, an actual Mary lived during turn of the century New York, just off the boat to America from Ireland. The fate of this young woman would have easily become that of millions of immigrants, of little importance except to family and certainly of no significance in history books. However, Mary became synonymous with fear and death. Unbeknownst to the character, at least at first, Mary was a carrier of the dreaded Typhus. The word “killer” is often spoken, but was Mary a killer in the normal definition of the word? St. Germain’s dialogue is concise and taut, Matthew Penn’s direction is purposeful with every minutia of movement. Settings and times are juxtaposed or layered. The talents of both men make for an intelligent team. Even though the play is relatively short (with an unnecessary 10-minute intermission), there are numerous and important philosophies which, to some degree, overshadow the depth that the actors are permitted to explore the characters. Themes of morality, justice, religion, ethics, science, and self-will fill the language eloquently, at a realistic pace. Yet, maybe there was too much to consolidate? 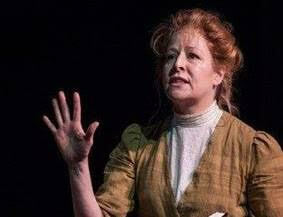 Tasha Lawrence portrays Mary as conflicted, at the same time vehemently upset by her circumstances. Her character doesn’t have a lot of dialog, but she is the emotional center of every scene. Lawrence is a physically beautiful woman who is intentionally pictured as beige. As a carrier, she is plain and innocuous. Kevin O’Rourke (Mary’s doctor) is recognizable to BSC audiences. Here he portrays shrewd and bombastic with balance in equal measures. Every St. Germain work sets the brain cells on overdrive. Audience members will take “Typhoid Mary,” just as they have other plays, home to be thought about, questioned, and even judged.